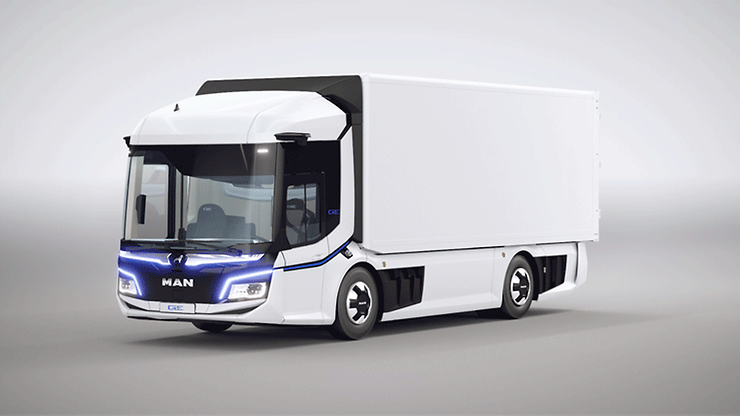 Curtain up for the new CitE concept truck from MAN. The future of city delivery transport is an elegant performer. With its avant-garde exterior, the truck resembles a work of art, and combines ergonomics and safety to provide high efficiency. This is complemented by innovation, driven by clean and quiet electromobility. Designed with our customers, made for our customers. The perfect truck for urban delivery and distribution transport, and a pioneering concept for the green city of tomorrow. Safety, ergonomics and design are the focus – with its fully reconceptualised vehicle and interior concept, the CitE has many ergonomic advantages and smart innovations, including the lowest entry and exit points on the market, large door openings and perfect 360° visibility. Thanks to a low seat position and wide, low windows, the driver always has a clear view of pedestrians and cyclists. The fully enclosed surfaces ensure that the risk of injury is minimised in the event of contact with a person. With 0% emissions, the CitE is an extremely clean and quiet mode of urban distribution transport, meaning that more night-time deliveries can be made. This is made possible by a 220-kW electric motor. Depending on how it’s driven, the CitE can cover a distance of up to 100 km. See the CitE – and be amazed. On the MAN Augmented Reality App, you can find out all the exciting information on this vehicle highlight for yourself. Just download the app and experience the CitE at its very best. Functional, safe, ergonomically sophisticated – all of these are key features of the MAN CitE concept. A huge step forward in the future design of truck interiors. In the driver’s cab, everything is geared towards maximum driving comfort and short distances to the controls. This saves time and offers real convenience. Healthy posture is key when MAN thinks about the workplace of the future: ample room to move around in the cab is the goal. The low windows allow the driver to make eye contact with pedestrians. This increases the safety of everyday deliveries. This makes everything easier: The digital aids in the driver’s cab assist the driver in their work and provide valuable data on the charge level. The lowest entry and exit points on the market, at a height of 35 cm, and the wide door openings ensure quick and easy boarding and disembarking. The driver’s seat can also be accessed quickly and easily from the co-driver’s side past the self-folding co-driver's seat, without having to stoop, keeping the driver safe from traffic on the driver’s side. The driver’s workplace is optimised to the driver; all the displays are in the driver’s direct line of vision, all the switches are arranged in logically and all the storage compartments are easy to reach. A valuable ergonomic edge in a demanding distribution job. The driver’s field of vision is optimally tailored to an urban environment. With the asymmetrical windscreen, the driver always has a clear view of traffic lights and a clear view ahead when exiting. In addition, direct eye contact with pedestrians and cyclists helps the driver to maintain an overview in the sometimes-hectic hustle and bustle of a city. The low seat position gives the driver a significant advantage in terms of safety since they are at eye level with weaker road users and can therefore make direct eye contact with them from both sides. The integrated digital display shows useful storage and consumption data for the CitE in modern, easy-to-understand formats. For example, the charge level can also be displayed and checked in real-time during the charging process. Thanks to the universal retaining device in the instrument panel, it is easy for the customer to attach their own digital equipment such as tablets, smartphones, etc. to the dashboard. Even from far away, you can see the pioneering design language that will shape the urban landscape of the future: Modular, versatile and low construction – for maximum efficiency in urban delivery transport. All this makes it ahead of its time, particularly in terms of design, technology and innovations. The CitE already stands out from the rest as a concept vehicle. Even though the main focus of its design is on efficiency and safety in urban traffic, the vehicle takes on a pioneering role primarily thanks to a host of new style elements. From the fully enclosed surfaces that minimise the risk of a collision, to its spacious and aesthetically pleasing cab with a modern door concept, right through to the iconic features of a genuine MAN truck, everything follows a functional but also progressive design language. When viewed from the front, you will see a fully electric truck, which unmistakably ties in with the elegant design language of the large MAN truck family. Genuine MAN vehicles are easily identified through the iconic chrome bar. At the same time, the many innovative accents such as the characteristic, elegantly curved LED daytime driving lights give the truck a completely new face that will light up the city of tomorrow. The innovative entry and exit concept opens up all doors in a very literal sense. The clearance width of the swing/sliding doors provides maximum safety and room to move, without having to stoop. The co-driver’s door can also be opened from the driver’s workplace at the touch of a button, which is ideal for avoiding the traffic on the driver’s side. This greatly improves the driver’s personal safety in the sometimes-hectic world of distribution transport. The MAN CitE is equipped with a 360° BirdView system. This shows an all-round view of the whole vehicle from a bird’s-eye view. The display is switched to show the integrated radio/navigation system depending on the speed. This means that the driver can avoid any obstacles or people in the immediate vicinity both when driving slowly and when manoeuvring. Collisions are effectively prevented before they occur. The all-over design concept of the CitE provides several advantages, with the fully enclosed surfaces ensuring that the risk of injury is minimised in the unlikely event of contact with a person. At the same time, underlying crash structures provides the highest stability and safety, primarily for the batteries. In addition, the large surfaces provide the best possible conditions for vehicle signage and advertising messages. Perfect for every city truck. With the pioneering, powerful electric motor and an intelligent battery and charging concept, the CitE is driving towards a clean future – and getting ahead of the competition. The alternative drive technology is an integral part of the new vehicle concept. Completely free of exhaust and noise emissions, it provides a better quality of life in urban areas and a tangible competitive edge. The e-motor has up to 290 kW peak performance: a lot of power for a 6-t payload with a permissible gross weight of 15 t. In addition, this e-drive does not need an engine tunnel, which is ideal for ensuring there is ample room to move around in the cab. The battery capacity of 110 kWh allows for a reliable range of over 100 km, which is more than sufficient for urban delivery and distribution transport. Thanks to smart overnight charging, the CitE always starts the new working day full of energy. This means there is no longer any need for long periodic charging breaks. You can, however, still charge using the standardised CCS charging cables if necessary. Environmentally friendly and smart: the CitE is an ultra-silent answer to constantly rising traffic volumes, ever stricter pollutant limits and bans on night-time deliveries. Hardly anything else is as flexible as the CitE; the solo design provides an interface to all the different urban applications thanks to its varied options for modular superstructures. The MAN CitE is essentially a collaborative project. For this city truck, the most important thing was that our customers had a large say in the design; only then could we create a concept to meet the many specific, real-world requirements of urban delivery transport. The result was truly impressive – both in terms of efficiency and design, the CitE is setting new standards that will revolutionise the urban distribution transport of the future. The concept of the CitE shines thanks to its modular design. This enables a multitude of potential practical applications in urban distribution transport. Whatever the task at hand, the CitE always has an answer. Refrigerators for temperature-controlled goods can be easily integrated and connected to the high-voltage power supply. The conventional method of delivery – but with significant advantages in terms of safety and ergonomics. Versatile, clean and quiet – the ideal conditions for a new generation of waste services. The option to move between the cab and the transport module provides an efficient and quick solution. Then don’t hesitate to get in touch! Find additional details in our extensive information material.